European leaders meeting in London were warned yesterday not to succumb to the temptations of protectionism or the irresponsible pump-priming of their economies in response to global financial market turbulence. José Manuel Barroso, European Commission president, made the appeal ahead of a "credit crunch summit" last night in Downing Street of the leaders of Britain, France, Germany and Italy. Mr Barroso warned against knee-jerk reactions to the global downturn, urging action that was "both targeted and proportionate". "We must not be tempted into protectionism." Is this the same José Manuel Barroso who last week published a proposal for enormous green tariffs against China? Prompting a massive trade war? Ring any bells? 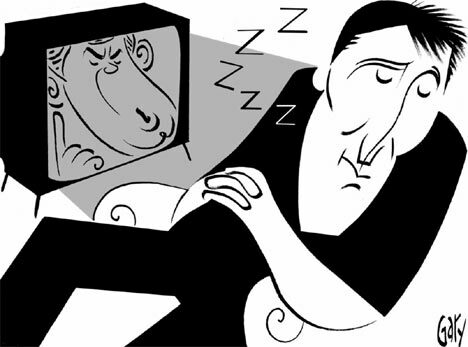 It seems that political leaders increasingly don't give a monkeys about what they are saying. Its just a load of blah blah blah tailored to whatever audience they are speaking to. Angela Merkel, Nicolas Sarkozy, Romano Prodi and Jose Barosso are in town for talks with Brown. Jim Murphy has been explaining the noddy series of "debates" that the Government plans to allow MPs over the Lisbon Treaty. He told MPs: "The motion enables members to debate the benefits of the Lisbon treaty for the UK and the international community through a series of themed debates." That particular formulation about debating "the benefits" tells you everything about the Government's approach - what little time it will allow is going to be filled up with vapid debates about motherhood and apple pie. With the first four hours of the eight days taken up with discussion of the Government motion, there will be one and half hours for real amendments. That's twelve hours of free debate in total. Remember that the consolidated version of the Treaty is 63,000 worlds long. Even just reading out the Lisbon Treaty - without making any comment on it - would take around five and a half hours. Moreover, with priority for ex-ministers and select committee chairs, there may well be no chance for Labour rebels to get their amendments even discussed. John Gummer said it was "very difficult for us to argue that this is proper Parliamentary scrutiny". Kenneth Clarke complained about "general topics chosen by the Government taking up the lion's share of the time" and said the arrangement was a "radical change" from the normal way legislation is scrutinised. Liberal Democrat Simon Hughes insisted the Government had got off to a "bad" start and was "alienating" even supporters of the legislation with its timetable. So there you have it: despite all the magisterial blether about how "detailed line by line Parliamentary scrutiny" is far superior to discussion by the hoi polloi in a referendum, the Government really doesn't want any discussion. 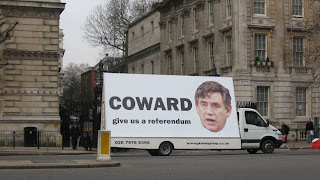 As we have said before - they are cowards. Because its a "vital cog in the process of social and cultural integration for Europe." Isn't that why everybody goes to watch the football? We're sure people at Anfield or St James' Park etc think of little else. There is so much going on already - and now the Commission decides to drop its energy plans on the world. 1) "Green inspired" -protectionism. The Commission's proposal for green tariffs marks the true start of the battle over (supposedly) green-inspired protectionism. The phoney war is over. The UK is clearly going to fight the proposal, but it is not clear how the other member states stand. So much for Mandelson's claim to have seen off the idea... Actually, perhaps we should stop attacking him as he is (at least on this one issue) at least on the right side on this one, albeit in a minority in the Commission. There is a certain inevitability about a resort to protectionism if you have a trading system. The EU Emissions Trading Scheme means a highly visible cost, focused specifically on large, mobile international businesses. Barosso said today "We want industry to remain in Europe. We don’t want to export our jobs to other parts of the world." But starting a trade war against the rest of the world might do exactly that. The problem is that far too little thought in Brussels has gone into how to design emissions-reducing policies at the least cost to competitiveness - in fact the economics is still pretty poorly understood. Broadly speaking, our recent report concluded that carbon taxes seem to be cheaper ways to cut emissions than subsidies. The EU has done too little of this kind of thinking in general - and has not explored tax at all – as the EU doesn’t have direct tax powers and so such policies would have to be run nationally. That means taxes are not therefore interesting to those who mainly see environmental issues as a way to promote greater EU integration. With so little thought about competitiveness, it is probably only a matter of time before we have factory closures blamed on the ETS. Indeed, if you look deep in the bowels of their website, that's what the Commission’s own research suggests. Some of the more federally minded people in Brussels would be likely to see this as something of a beneficial crisis – plant closures would be an excuse to impose EU green tariffs, which in turn boost the idea of a European identity and bolster the importance of the EU. That might sound a bit twitchy – but there really are (important) people in Brussels who think like that. As Delors said: "If this job was about making a single market I wouldn’t have come here in 1985. We’re not here just to make a single market – that doesn’t interest me – but to make a political union." Or as Milliband put it, "the needs of the environment are coming together with the needs of the Union." Or, as Barosso (more subtly) said today: "If some people in Europe have doubts about the need for the European Union, I think this is exactly the kind of policy that shows why we need a strong European Union more than ever." Point scoring rather than effective environmental action seems to be the motive for too many people in Brussels. One fundamental issue is that all emissions reducing policies involve some kind of economic cost - though some have a much bigger cost than others. In public the EU generally accepts that there should be different levels of effort from different countries, so isn't it inevitable that any emissions reducing policies will have an impact on relative competitiveness? The two possible answers to this conundrum are either to reduce the cost of your own emissions reducing policies, or to insist on green tariffs on all developing countries. We think the Commission is on the wrong side of history on this one. 2) Biofuels survive for now, but for how long? It's amazing how the scientific / economic evidence has piled up against biofuels recently – particularly Andy Bounds’ FT report last week on a leaked document showing that the EU’s own scientists don’t believe in biofuels. Our own recent report makes it clear that European biofuels are the least cost effective way to reduce emissions out there. Talk about a "second generation" is basically just taking a punt on something that may never work. And of course, if it does magically work, we can always do it later. When we were writing our recent reports it became pretty clear that the advocates of every single different technology all claim that they will make huge leaps forward in cost-effectiveness in the coming years. Biofuel fans are not the only ones who make such claims. (1) "Sustainable" biofuels here means that you didn't burn down rainforest after 31/12/07 to plant them. A lot of the land clearance for predicted demand has already happened. (2) How enforceable is this? The EU can't control agricultural fraud in Europe, never mind monitor what is going on in the depths of Latin America. Biofuels are perfect for fraud too - untraceable, commodified, mixable. At least the EU can try to count subsidised goats in the mediterranean EU member states. Good luck trying to prove that your biofuels are sustainably sourced. (3) Even if we could solve problems one and two, the whole idea rests on an illusion. Even if you could make the biofuels "sustainable", the huge target the EU is setting (roughly equal to US plans) will drive up food and land prices. So Brazilian landowners can grown the biofuels on existing farmland, and burn down the rainforest to plant now more valuable food. It’s like squeezing a balloon - the pressure just comes out elsewhere. 3) Are today's targets just a fantasy, or is there a cunning plan? Are we really going to build two giant windmills every day between now and 2020? It seems unlikely somehow. Or is the Council going to redefine nuclear as a “renewable?” That sounds more like the likely euro-compromise. 4) Running the ETS from the centre = taxation without representation. Speaking of beneficial crises, the EU has decided to respond to the failure of phase one of the ETS (and likely failure of phase two) by demanding that it is allowed to determine member states ETS targets from the centre. This may just be politically completely unrealistic - we don't know. Certainly many member states only take part in ETS, and other green policies, safe in the belief that they won't actually have to do anything, and will probably be able to make some money out of it. Few will be keen to be definitively told how much effort to make. Nonetheless, assume it were eventually to happen. ETS is basically a (disguised) tax. Central control over the level of scarcity determines the value of this tax. In other words a centrally controlled ETS would be the first true EU direct tax. Is that what we want? (5) The path not taken. Another way to do run a European emissions policy - or any other international emissions policy - is to have states set themselves demanding targets with legally binding fines. (Funnily enough, the EU members have turned own the option of making the Kyoto fines legally binding). You could then leave member states to hit their target their own way, instead of trying to micro-manage how the member states should hit their targets. Given that the Commission's micro-management involves pushing members towards policies that are either sub-optimal (renewable subsidies) or actively damaging (biofuels), the need for a different approach seems more urgent than ever. Well, at least some of the papers have picked up on our use of BERRs own numbers to suggest that the Commission's estimate for how much its grand proposal is going to cost is rather an underestimate. BERRs methodology suggests up to 730 pounds for a family of four every year. There are some bits in the Mail , Sun, Telegraph Express , and Evening Standard . There is a good leader in the FT too: "Most damagingly, the privileged status of renewables takes the focus away from energy efficiency, by far the lowest-cost means of reducing emissions…"
Also, as if to confirm the point we were making about the danger of a highly visible price focussed on highly mobile firms, there is a piece in the IHT about how workers at a Belgian steel plant have gone on strike to protest against the EU Emissiosn Trading Scheme. A union leader says "You could call this the first carbon dioxide industrial action". Doubtless it won't be the last - as long as the EU's green policies are designed in a way that practically encourages companies to relocate. Gordon Brown will extend an olive branch to the Liberal Democrat leader Nick Clegg this week by setting out options for replacing the first-past-the-post voting with a fairer system for Westminster elections. The publication of a government paper on proportional representation by Jack Straw, the Justice Secretary, is seen by senior cabinet ministers as a move to prepare Labour for power-sharing with the Liberal Democrats if there is a hung parliament after the next election. Mr Straw will not set out any hard proposals, but it is known he favours the additional vote system, which he introduced for elections to the European Parliament when he was Home Secretary. "Jack would support AV, if there is a hung Parliament," said a senior minister. "It could be discussed after the next election." The Jenkins Commission proposed a new AV "top-up" system in January 1999, but it was never acted upon by Tony Blair. Under the plan by the late Lord Jenkins, the former leader of the SDP, 80 to 85 per cent of MPs would have remained directly elected on a constituency basis but the Commons would have been "topped up" with 100 to 120 MPs chosen from regional party lists, proportionately reflecting the votes cast in the general election. 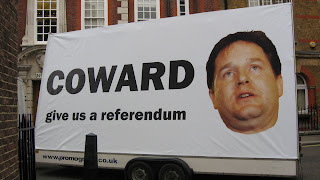 Nick Clegg, the Liberal Democrat leader, today accused the Tories of "playing games" over the EU treaty, as he defended his decision not to call for a referendum on the issue. Clegg spoke out after Labour saw off the first of many expected Eurosceptic challenges last night, when the government won a preliminary vote on the treaty with a majority of 138. In a blow to Conservative hopes of scuppering the bill, Clegg said: "We would support the government by not voting for a referendum. From Gallery News comes info that the Speaker has decided not to allow the Labour rebels reasoned amendment for a referendum to be discussed. A vote on the whole Bill is due at about 10pm. The Conservatives will vote against and the Liberal Democrats in favour. MPs are not allowed to criticise such decisions - or even talk to the amendment which has not been selected. However, we aren't bound by any such rules - if Speaker Martin is going to manage this debate in a biased way (he personally is not keen on a referendum) then he will face increasing criticism. We are watching you. One minute the Government is banging on about how it believes in "detailed line by line scrutiny in parliament" (to avoid a referendum). Would you buy a used Treaty from this man? PS - Also on the Northern Rock front - apparently the beleaguered bank has come out in support of the Lisbon Treaty (well - they need the EU to let them off state aid rules). just what are the lib dems up to? The speccie blog reported last week that the Lib Dems have hit a snag with their plan to push for an "in or out" referendum to cover their tracks as they back out of their manifesto commitment to a referendum. The Clerks say such a referendum has nothing to do with the Lisbon Treaty (ha!) and so it can't go down. One interesting number to watch as the committee stage goes on is whether the Government majority goes below 63 at any point - as that will make it clear that it is the Lib Dems blocking a referendum. That might be the point at which people start peeling off. A lot of the MPs are not happy with the current position because (a) they know the Lisbon treaty is not "completely different" to the Constitution (b) they don't particularly want to lose their seats and (c) as Lib Dems they didn't go into politics just to spout a disingenuous party line. But will they stand up and be counted? Watch this space. "The government did promise a referendum on the now defunct constitutional treaty; and, rhetoric and legal form aside, the Lisbon document is substantially the same as that rejected by the electorates of France and the Netherlands. British voters want the same opportunity." Jim Murphy is obviously keen on recycling. On his tedious blog he bangs on about how "Over 3 million British jobs – tens of thousands of jobs in every region of the UK – are directly linked to our membership of the EU". Quite apart from the fact that this is a huge load of balls; and apart from the fact that it is merely intended to steer discussion away from exactly how much the Government want to sign away through the revived EU Constitution; and apart from the fact that we have heard it about a million times before... the striking thing is that the Government can't even be faffed to find any new evidence. Murphy simply blows the dust off a vintage 1997 economic study to back up his "argument". Likewise today Gordon Brown is also reaching out to the public... by speaking to a Foreign Office organised event stuffed with cronies from "Business for New Europe". He too drones on about 3.5 million jobs etc etc. "What is clear is that at this time of global economic uncertainty, we should not be throwing into question our future membership of the EU - risking trade, business and jobs..."
And so on blah blah blah. There is no attempt to make an argument for the Constitution. No Milliband-style nonsense about why we need it or should want it. The truth is that neither of them care. They are perfectly happy to trot out all this tired old rubbish because it is part of their overall strategy. The government calculates that by using the most powerful forces in politics - apathy and boredom - it can get away with its ludicrous, outrageous decision to back out of a referendum. Only time will tell if they are right. Tony Blair, president of Europe? 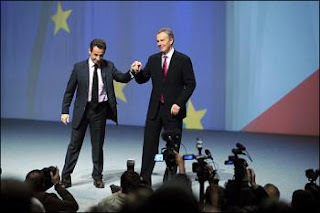 Sarko said: 'He is intelligent, he is brave and he is a friend. We need him in Europe. How can we govern a continent of 450 million people if the President changes every six months and has to run his own country at the same time? I want a President chosen from the top - not a compromise candidate - who will serve for two-and-a-half years,' added Sarkozy. According to the Guardian Jean-Pierre Rafarin is backing him too. And "At the end of this month, Blair will continue his campaign to win the leadership of Europe when he addresses a conference at the Sorbonne of Les Progressistes, a breakaway socialist party group which has joined Sarkozy's government." How odd... Britain's former centre left leader is going to be speaking to the party conference of France's centre right party. The French press initially reported it a while back, but then said it was off. But now the UMP site confirms that Blair is going to be at the UMP conference at the end of next week. He is also going to be doing another gig with Sarko in February to coincide with the ratification of the Lisbon treaty by the French Parliament. Presumably Blair already has the whole middle east peace thing sorted out... (we knew it was only a matter of time once Tony got on the case) ...but nonetheless it does seem slightly odd. So what's the explanation? One possible explanation is provided by a leader in the Frankfurter Allgemeine Zeitung which suggests that the two names in the frame for the new job of President of Europe under the Lisbon treaty are Luxembourg mayor Prime Minister Jean Claude Juncker... and a certain Mr T. Blair. Thought you had seen the end of him? Think again. There is one common thread running through the whole agenda - synergy. It represents what the European Union has been founded on from the very beginning. It denotes the work we undertake in common, work which achieves results that are greater than the sum of each individual contribution. Let us be fully aware of this added value. Let us make better use of it. It is not just the synergy between Member States and institutions. It is also the synergy of all areas of activity, all goals and all strategies. The synergy between citizens, generations and cultures. Between the European Union and other world players, regions and continents. As if that were not excitement enough... we also learn that "2008 is the European Year of Intercultural Dialogue" and that we should gear up for the "Meeting of the High-Level Group on Gender Mainstreaming" on the 10th of January. Woo-hoo! For all the endless rhetoric about an outward-looking, "Global Europe" - the EU, with its endless meetings and obscure processes, remains fundamentally an inward-looking, non-future-focussed kind of community. The political culture that produces high level meetings on gender mainstreaming (though it may well be laudable, whatever it is) is certainly *not* going to run the 21st century.